Months ago I started reading a book. For the life of me, I cannot remember the book or the author. But the author made a statement that has stuck with me ever since: It is easy to have faith when God says yes and everything happens the way you want it to, but it takes a deeper faith when God says no. The moment I read those words, I wanted that kind of faith. I should know by now to be careful what I wish for. In order to develop a faith strong enough for God to say no, I have to let Him say no. And that’s not easy. In the last few months, I think that is about the only word I have heard from God: no. In big things, like selling our house, to little things, like finding Philip’s lost glasses. I have asked…and not received. After a while, it has weighed down on me and made me ask what is faith really? I think we subconsciously view faith like this: if I have enough faith, God will do it. If I don’t, then it’s my own fault. And that has paralyzed me. I am a woman of little faith. Some people have the gift of faith. Not me. I have always been a logic, scientific kinda gal. I need to see it to believe it, figure it out, understand how it works, and then I will accept it. So because of my natural inclinations, does that mean I will see less of God’s blessings? Because I don’t have enough faith? Then it hit me today: that kind of thinking is the same kind as hoping I am good enough for heaven. People who strive to be good enough for God always have a fear in the back of their mind, “Am I good enough?” Same with faith. “Do I have enough faith?” And when a loved one dies, or the bank takes the house, or you lose your job after praying hard on your knees, you can’t help but think you didn’t have enough faith, so God didn’t provide. But in the end, doesn’t that place everything on ourselves? That we need to first have faith, then God will work? Perhaps our view of faith is wrong. It is not about what God does, but who He is. Because if our faith is set on what He does, then we are going to be disappointed. But if our faith is set on who He is, then we will be confident no matter what happens because we know that He is in control. When He says no, we will not be shaken. We will believe He has a reason for saying no, a reason we may not see or understand (after all, if we truly understood everything God did, then He wouldn’t be much of a god, would He?). 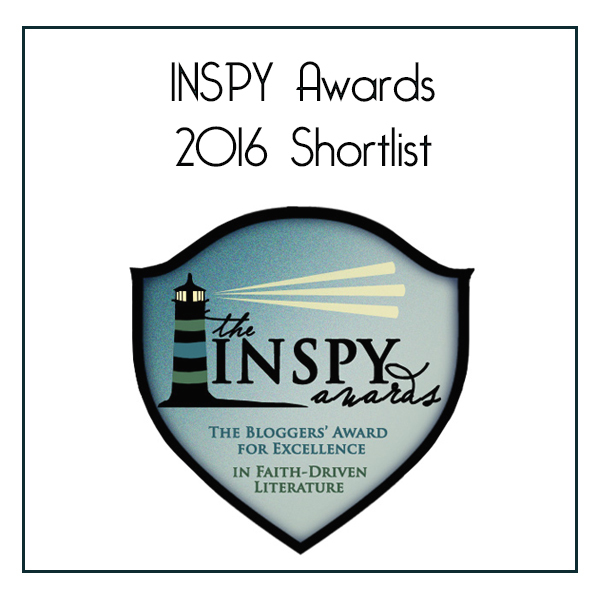 I still have a ways to go in developing this kind of faith, a faith placed squarely on God. But I want it. And I will continue to pursue it. How about you? Has God told you no before? How did you react? Was it hard? Did your faith grow from the experience? Yes, yes, and yes! Such a good post. 🙂 I don’t think I can answer your questions in a single comment via phone, ha! But my journey has definitely seen its shares of no and struggling with the faith aspect, but for sure I have grown from it. How appropriate, given the week I had last week. Thank you for putting it all into perspective. Great! post, I really need to hear that today. 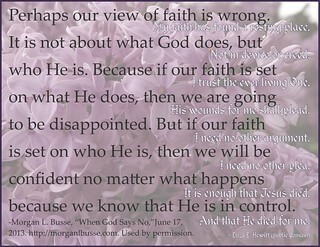 So important for us to look at what faith really means, Morgan. We’ve been influenced by our culture, I’m afraid, into believing that belief itself is what has power. “It is not about what God does, but who He is.” Thanks. I recently finished _Daughter of Light_, and expect to start the next book very soon. Thanks for them, too. Your welcome, Martin 🙂 Thanks for stopping by! I’m by again. Sorry. I occasionally create posters, licensed under Creative Commons, in my Flickr account, from whence they may go to my blog or Facebook postings. I’d like your permission to use the four sentences, beginning “Perhaps . . .” to do a poster. I would, of course, credit you. If this is not OK, that’s fine. It’s your work. Feel free to delete this comment, either way. Thanks, either way. I will also use it in my blog, and it is posted to Facebook. Thanks again. Thanks, Martin 🙂 I hope it encourages a lot of people.